Even though AVC2013 is a long time from now, you might want to read up on the changes so you can start planning your entry. Hello everyone! Is this really a post about AVC? !I know it might seem a bit early to be announcing AVC 2013, but we're making some big changes and wanted to let everyone know in advance what to expect for next year's AVC. 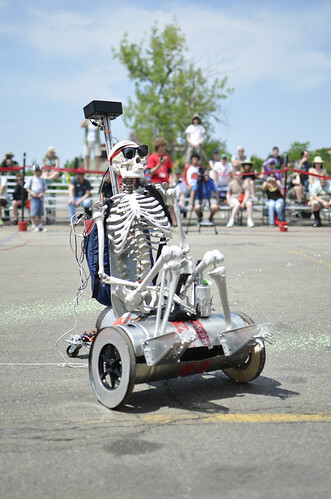 It's changed a bit every year, but after some feedback from competitors, spectators , SparkFun employees and yours truly, we've decided to do a complete overhaul for the new competition, scheduled for June 15th June 8th of 2013. Don't worry, we're still going to have autonomous vehicles. That part is staying the same. However, we're expanding the list of 'allowed' vehicles. Basically, if it can move on its own, you can bring it. Big, small, excessive, simplistic, we'll take it all. We're also not going to limit the amount of entries. That's right, we'll take anyone with a vehicle that pays to enter. 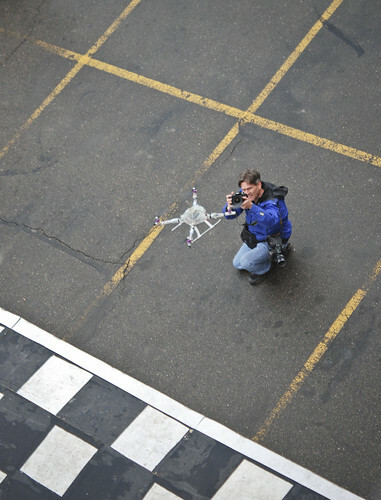 And for all the aerial folks out there, dust off your quadcopters and helicopters, they'll be allowed next year. At this point, you might be asking yourself, "Self, how can they possibly allow unlimited entries, quadcopters, and massive-scale robots at their current location." Well, that's the catch. 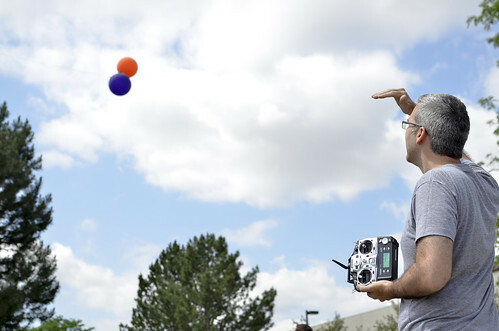 AVC 2013 won't be held at SparkFun headquarters and the aerial and ground competitions will run concurrently in separate locations. AVC won't be at SparkFun, ERMAHGERD! You see, we've had some pretty intense growth over the past few years. Even though we thought our current building would be more than we could ever use, we're starting to get crowded. It's gotten so bad, Dave's even offered to share my office, but I only have one chair, so things might get a bit awkward. Instead of going to such great lengths, we've decided to start looking at other buildings. By the time AVC 2013 rolls around, we might still be in our current building, but there's also the issue of the aerial part of the competition. In addition to the physical restraint of our current building, we never really had a great place for aerial vehicles to compete. With so many people in such a small space, safety has been a concern and is the primary reason why we prohibited quadcopters last year. And why not spice things up while we're at it? Sure, they can fly around the building, but why not have an aerial obstacle course, or have the entrant drop something on a target on the ground? How the actual aerial competition will look is still up in the air (ha!) but plan on it being much more involved than just navigating between waypoints (and will be largely dependent on the venue we choose). We're even including aerial-specific bonus awards! All this talk about mixing it up for the aerial vehicles got me thinking about the ground vehicles. Last year, 0x27 amazed us with a time (after deductions) of only 2.08 seconds! A few of the teams are bringing impressive vehicles and we want to give them more of a challenge. Also, what about robots that aren't necessarily designed for speed, but rather for style or aesthetics? Since we're allowing unlimited ground entries, how do we give everyone a fighting chance? Each class will have its own 1st, 2nd, and 3rd place prizes (TBD). The Doping Class will carry the highest prize money, so if you want to compete with the big boys, you will get the biggest prize. Students will compete in the class which best defines their robot, so they could theoretically win both the student award as well as another class award. Since we don't yet have a secured location, the actual GPS coordinates of the course are undetermined. We will be posting a course preview video as soon as we secure a venue for AVC 2013. We are attempting to find a location as geographically close to SparkFun as possible though. If you are starting to build your vehicle now, it will be very similar to previous years. Design your vehicle so you can press a button, have it navigate through pre-determined waypoints, avoid some obstacles, and win fame and glory. As we finalize the location, we will be finalizing the rules as well. For now, start planning your vehicle, stay tuned as we post more updates, and get pumped for AVC 2013 - it's going to be epic. My daughter and I competed as a team last year (team Short Circuit), but only because AVC fell after her school year had ended. We live in San Diego, so getting there is either expensive, or a long drive. However, driving is off the table if my daughter has to miss any school. So, if possible, please try to keep a later date for AVC. BTW, my daughter got so caught up in AVC that she now want to build her own vehicle, so AVC has become a pretty big deal to us. Thanks again for putting it on. We're attempting to fix this. Our building has been problematic with GPS signals. A new venue would not have such issues. The idea of classifications for entries makes it possible for 'the little guy' to compete along with people that have a $3k GPS. you would not be in the same classification. Ultimately, you would be competing against similar vehicles next year. My suggestion for EVERYONE is design a system in which you turn on the vehicle and it enables/calibrates all your sensors and gets a GPS lock. Then make a single button (preferably red) that makes it 'go'. Don't wait for GPS lock at the starting line, have it on and ready to go in the pits. That helps a lot. Just starting 10 people at a time will always cause some issues with getting a lock. Thanks! Also, perhaps consider providing a wired ethernet option in the pits, as the wifi never worked very well last year. I suspect that all the 2.5GHZ RC transmitters people brought factored into this, but I had a heck of a time getting to Google Maps to readout and display my GPS race logs. If we move locations, we won't have the ability to use our own personal wifi, so we'll need to come up with a data solution. a more robust wireless network or wired network will be a must, I agree. we do encourage people to use their phones or ipads if they have access to them of course too! Some of us are still waiting with bated breath to get more info on the venue, track and rules for AVC 2013. Anyone at Sparkfun want to comment? Any chance of allowing aquatic vehicles (boats)? Here's hoping that the entire course is visible from the starting line (so we don't have to RUN after the bots)! Yeah, nowhere near 40. Mine was peaking out at 20 on the longest straight. "You were drag racing in a Prius?" +10 for the Horrible Bosses reference. "Yeah, I don't win much"
Here was my blog post about the race shown above. I had the first/only autonomous quad to fly at the race and am likely to blame for getting them banned last year! We did hold our own event called the Multi-copter rodeo, which I finally won. Since the vehicles are autonomous, I want to have my bot drive itself from Philadelphia to Sparkfun HQ with a RV trailer with my bed on the back for Sparkfun AVC next year as a plane ticket is too much. Any updates on a venue? Yes! and expect a full announcement with rules etc. in the next few weeks. Regarding the price restrictions, I am building this: http://letsmakerobots.com/node/34827 and if you look, I have a solid state computer I am hoping to make the brains of it. I will probably not have it finished in time. anyway I was wondering, similer computers I have seen have a very hefty price tag, but, this one was given to me, so I didnt pay anything for it, would it count toward the robot's price tag? I think I have a fairly good chance of geting into the Under $350 class if it doesnt. I'd like to start working on the robot soon, are there any basic rules such as size, speed and weather we can use differential GPS? Sounds like it will be fun! Minor typo-- I think a better term for the catch all category is "Peloton"
I wonder if Stompy will be done in time. Some simple autonomy software (GPS + 9dof for waypoints) would make that an interesting if deadly entry. I wonder if the waypoint hoops would still work for something >3m tall and >5m wide. Never going to have the same flavor in another location, but that's the price of progress. The aerial competition should be on a large farm with no trees. Hopefully the new course will be revealed some time before next May. Will like classes compete together? I mean, will a given heat consist of all micro bots or all Pelaton, or will they be mixed up? Also, in a similar vein, will the course for the micro bots be shorter than for the Doping class, or are they all on the same course? most likely, classes will run together. the course will be the same for everyone. If a bot technically fits into multiple classes, who determines the class it competes in? Sparkfun officials, or the entering team? we do, but we will discuss it with the entrant. Great news on implementing weight/prices classes! 0x27 demonstrated what can be accomplished with a very high-end, expensive GPS and a big, spendy chassis, but now the average individual's bot can still be competitive on a reasonable budget. The unlimited bots will put on a great show and the $350 limit will drive some cool innovations. very valid point and noted for next year. we can do something like a high-contrast yellow or something. we can tell everyone which spraypaint we used so you can go out to the store and test it yourself. The hoop is also a challenging feature for detection and tracking, as it had a very low cross section, which made it hard to detect with something like ultrasonic sonar. Even a laser scaner would have difficulty with a target like that unless it had something like retroreflective tape on it. Please consider providing multiple ways to detect and track obstacles, such as distinctive glyphs, reserved colors, reflective tape, etc. Well I am technically a student. How many do you expect in that class? too soon to tell. last year there were a handful, maybe 3-5? On our first run, 0x27 (the big robot that slammed around all the barrels) knocked the hoop out of position and, as a result, our bot snagged on it. To my eye, we'd have made it through if it hadn't been moved. That didn't seem quite fair, but we pressed on. On subsequent runs, we saw similar issues with the barrels and managed to evade them with dumb luck. However, our proudest moment was when our bot's sonar actually detected and avoided the last barrel on the course. I'm not sure it's possible to have this kind of event without bot to bot interference being an issue, but it was frustrating to lose one of our precious three runs, and a chance to finish the course, to issues like barrels and hoops being moved around unexpectedly. Our main goal is participating is to master the technical challenges of the race, so we definitely applaud the decision to organize cars into classes, as we were seriously concerned that our car might be run over and destroyed by some of the bigger bots we had to race against last year. I'm leaning towards a dynamic course. as I've said before, you must use some sort of object avoidance, so it shouldn't matter too much where the obstacles are. but, we'll keep thinking about it. Here's an alternate suggestion: Consider having shortcuts that take distance off the course, but include obstacles. That way, some could choose to go the long way and avoid obstacles, and others could take on the obstacles to get an improved time. There could even be more than one shortcut possible, each with different, or increasing levels of difficulty and distance benefit. I like it, but it seems like a LOT of variables. We would certainly get complaints that the shortcut was easier for others, or that the time bonus was too short, or too much, etc. Once course for everyone is probably going to be the best way to go. But I'll keep this in mind. I remember playing SSX and having a blast trying to master the alternative routes. They were usually harder with jumps and hidden passages, but usually made for a faster time. How about a big jump in the shortcut? Significantly risky for most, but good for a show for those that try. Everybody loves robotic carnage! however, the rules last year did explicitly state that the barrels and hoop would move throughout the day, so object detection and avoidance was absolutely necessary. we will post more updates as we make more decisions, but most likely the obstacles will be somewhat variable again. I really like the idea of having a Less Than X$ class! It really encourages creativity and re-use. For the Micro/PBR class, it says OR . Does that mean that it could cost more than $350 if it was smaller than X? Also, I've been itching to build a rover based around the Traxxas Mini Revo, but it's dimensions are just outside the box. So close! It fits great inside my toolbox, so it's a really convenient size. what about making a robot out of the X-01? That would call for negative time on the regular AVC course!!! 40mph? How about a 100mph? yes, it's 'or'. so, you can spend $10M, if it can fit inside that box... chances are, if it can fit inside that box, it's speed will be somewhat more limited than something bigger (generally speaking). I am evaluating other platforms, mainly in the 1/18 scale RC selection. In doing so, there seems to be a lot of platforms that don't quite fit, but are close. 10"x6"x4" is 240 inch^3. Would it be possible to enter a robot with outside dimensions of 9.9"x7.2"x3"? It's slightly larger in one dimension, but smaller in others, with a lower overall volume (less than 214 inch^3). Is there any chance that a robot with dimensions such as this would still qualify for the Micro category? I'd be OK with this, as long as the overall volume is less. I'd like to enter both the ground and air events.... I'd planned to do so this year and did not get the flying creature done in time.... So if there is some way to alow one team to enter both that would be very welcome! you could simply purchase two entries. If you let us know, we can make it so you can compete at different times, so you could do both. but bringing someone or some people to help wouldn't hurt either. Oh hey! Yes, that would be fine. Like I said, you might need to bring someone to help out, but this is doable. We can easily see if you bought two entries, and the heat schedules are made up by hand by me, so I can easily make it so your air and ground vehicle don't run at the same time. There should be another class for teleportation. I don't feel that my self-teleporting device should be classified as "non-traditional locomotion" or "pelaton"
teleportation is clearly non-traditional locomotion. Potential spectators are already trying to decide which event to attend. I suggest attending one, and watching the other live on your iPad. Looking forward to it! they will be held in roughly the same place. since the number of entires will most likely be higher, it will be an all-day event for each. you can easily just walk between the two venues (like a concert) and see everything. I would like to get some clarification around obstacles. The bigger bots this year just barreled (pun intended) through the obstacles. Will that still be OK, point-wise? Or will there be deductions for hitting barrels, or knocking them over? Yes, just barreling through them seemed to go against the spirit of why they are there. good question. This is still up in the air. I disagree about chartle's comment below, saying it goes against the spirit. if you watch the video posted above showing 0x27's run, he clearly went through both, but was able to correct and still go through the hoop and get back on track. I dare anyone else to try that. that is NOT easy and it would have certainly been easier to just avoid them in the first place. someone asked me last year what prevents them from just making a 100lb+ robot that can push its way through the whole course. my answer? money, motor drivers, materials, battery system, etc. it's much much harder to build a bigger and heavier robot than a smaller one. so, if you can pull it off, you're more than welcome to push around the barriers. that being said, we may add a more 'permanent' physical barrier next year. Personally, one of the highlights for me was the bot that just blasted through the barrels at RAMMING SPEED! One other issue is ok lets just (pun intended) barrel through them launching them into the air. I would be be pretty upset if I built something that was designed to avoid a static or slow moving barrel and I experienced Death from Above. If you can manage to automate a tank, please do bring it. we would not put other vehicles with you (unless there are other tanks) as to minimize damage to other entrants. Seriously, bring a tank. If you can get it here, we'll allow it. In my best Barney Stinson voice. Jersey barrier maybe? That would be entertaining watching a vehicle ram one of those at speed! Yes can rent them but you also have to rent something to move them, but you can also get ones that you fill with water. 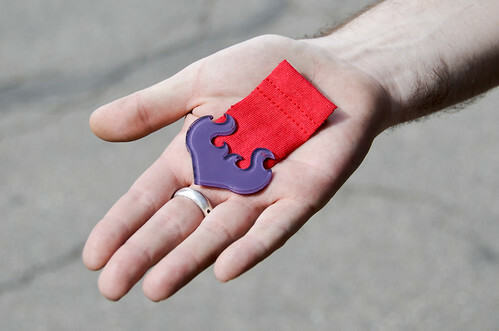 These look perfect http://www.plasticjersey.com/products/mobile-cade/ in fact it looks like the example they have is a course of some sort. the boxes on the corners is a great idea though. we thought about it last minute and just weren't able to pull it off last time. Which is why the point of the competition is to not hit the obstacles. Whether it's immovable obstacles or point reductions, I doubt that "power through" will be a valid strategy next year. I agree, making a barrier intended to damage the vehicles seems like a very bad idea. It should be a time penalty (or time bonus for missing them) just like the hoop. Small enough time penalty so competitors can decide "should I lose a 2 second penalty by blasting through, or lose 2 seconds in navigation going around?" this is good. completely avoiding obstacles could be an additional bonus. I like it. You should fill half with sand and leave half empty.... Barrel roulette! Since Battle Bots is pretty dead right now, how about weapons of some sort? 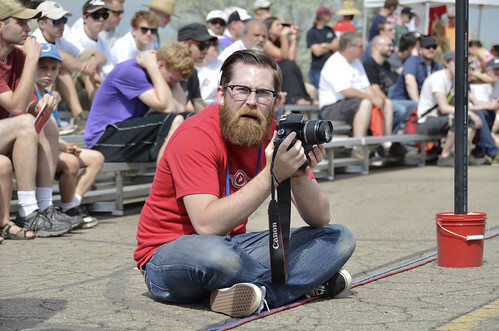 Robogames (http://robogames.net/) in San Francisco/San Mateo,CA has had combat robots since 2004. The event is much bigger than battlebots was and the robots are much more destructive. Besides that there are 5-6 other battlebot-type events across the US every year. Just because robots don't have "weapons" doesn't mean there isn't carnage, and carnage is the fun part! To my chagrin, my robot doubled as a battering ram and ehm... smashed a stool. As a clarification, if a team of students construct a $2000 robot, which weighs 50lb, fits in a 10"x6"x4" box, and is powered by rubber bands, what category(s) would it fit in? The "made of solid gold" category? this particular competition will remain strictly autonomous and won't include battling. a different competition for that might be something we could look into. The more I think about it I guess you don't want to be the part of the end of civilization. Putting weapons on an autonomous vehicle could lead to skynet and you know what happens after that. Well then the US air force would definitely win. SparkFun AVC 2018 is a Wrap!